What is a mandala in Hinduism? Question: "What is a mandala in Hinduism?" Answer: Mandala is the Sanskrit word for “circle.” The term mandala was introduced into the Buddhist and Hindu religions as an aid to meditation. A mandala is a vaguely circular shape with repeating patterns. Some mandalas include a square with four “gates” within the circle. Each gate has a center point in the form of a T. To a Buddhist or Hindu, a mandala represents a cosmos within the universe. It is considered a sacred art form with spiritual significance. In Western culture mandalas are often found in diagrams, charts, or geometric designs. 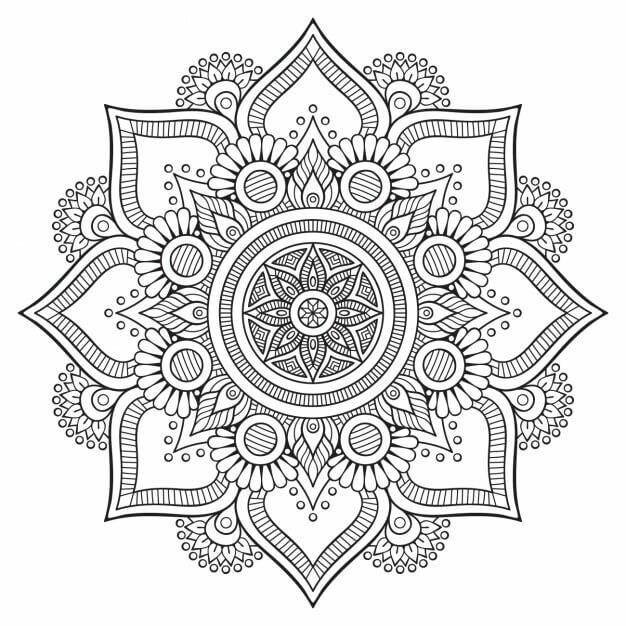 Mandalas are recently popular art forms used in adult coloring books. They are intricate and beautiful once color is added. But should such religious symbols be accepted by Christians as art forms or coloring pages? In Hinduism, mandalas have both religious and political significance. Their intricate designs can symbolize various forms of power in government, as well as spiritual focus and unity. A mandala can represent a governmental system and can be used as almost a map of a particular political infrastructure. In religion, the mandala itself is not seen as having supernatural powers as an idol might. It is merely a tool used by Hindus to aid them in focusing, “centering,” and meditating. Many traditional mandalas include depictions of a lotus flower, which is sacred in Hinduism and some other false religions. The intricate designs found within a mandala have significance for devout Hindus, but that significance is usually lost to the general public. Because Hinduism is such a loosely defined religion, mandalas have no strict definition or usage, either. The question arises as to whether Christians should shun mandalas because of their significance in false religion. Some people believe the mandala’s association with paganism requires Christians to avoid them the way they would a carved idol. Since an idol is a representative of godless religion and thought to have supernatural powers, it should not be enjoyed in any way by followers of Jesus. Other people are completely unaware of the mandala’s religious ties and simply enjoy the beauty and intricacies of the designs. And some Christians land in the middle of these two views: they are aware of the Buddhist and Hindu origins of mandalas but see no problem with enjoying them as coloring projects or in other artistic avenues. Since there is no religious significance attached to a Christian’s use of the mandala, is the picture wrong in itself? The answer to whether or not a mandala is wrong has to do with one’s conscience and motivation. Paul addresses some similar issues in great detail in Romans 14. In his day, the question was whether or not Christians should celebrate the Sabbath or eat food offered to idols. People in the church were taking sides and creating division. Each faction hoped that the apostle would side with them and tell the others how wrong they were. Instead, Paul wrote, “One person’s faith allows them to eat anything, but another, whose faith is weak, eats only vegetables. The one who eats everything must not treat with contempt the one who does not, and the one who does not eat everything must not judge the one who does, for God has accepted them” (Romans 14:2–3). He went on to say, “One person considers one day more sacred than another; another considers every day alike. Each of them should be fully convinced in their own mind” (verse 5). His conclusion was that “whatever you believe about these things keep between yourself and God. Blessed is the one who does not condemn himself by what he approves. But whoever has doubts is condemned if they eat, because their eating is not from faith; and everything that does not come from faith is sin” (Romans 14:22–23). Paul stressed the importance of having a clear conscience in matters that were not clearly sinful. When we apply that principle to mandalas, our stance should be, “What would God have me do? Does my conscience bother me when I enjoy a mandala?” If we can’t color, paint, or enjoy mandalas without thinking of Hindu religious practices, then it is wrong for us. But just because one person’s conscience condemns him does not mean the consciences of others are so condemned. On the other hand, if we are hosting a former Hindu who equates mandalas with false religion, then it may be offensive for us to display our mandala collection. Doing so could cause a brother to stumble (1 Corinthians 8:13). Our highest priority must always be unity, purity, and doing everything for the glory of God (1 Corinthians 10:31). I am a Hindu, why should I consider becoming a Christian? Should a Christian woman wear a bindi?